Earlier this year electric vehicle advocates were wondering aloud on social media if the Tesla Model 3 would be the end of the BMW 3 Series. The hubbub began when an investor, Facebook millionaire turned venture capitalist Chamath Palihapitiya, commented that “There is not a single person of right, sound mind and body, if you could build a Tesla Model 3 online and get it delivered in 30, 60, 90 days, or you have the choice of buying the BMW 3 Series will choose the BMW.” As it turns out, now that the Tesla Model 3 has been on sale for well over 90 days, the BMW 330e is outselling Tesla's Model 3. 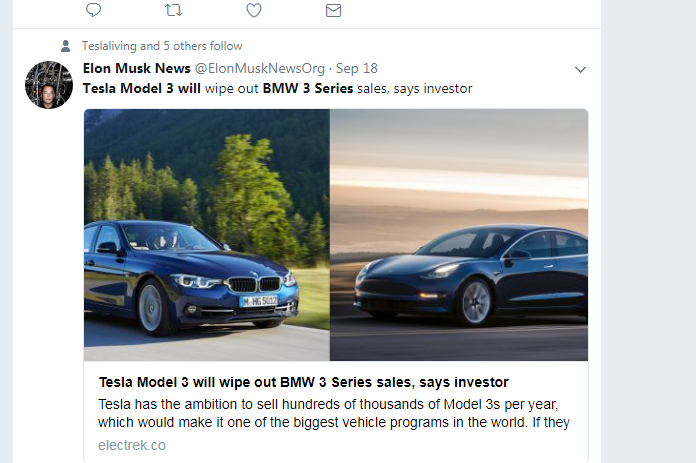 What Chamath Palihapitiya meant in his comment, here put into context by a tweet and article from electrek, was that if Tesla could actually build the Model 3, nobody would ever buy a BMW 3 Series car again. By extension, we assume a BMW 2 Series or 4 Series as well, since all three of those share the same platform and drivetrains. He is welcome to his opinion, and it may well turn out to be true. Someday. Maybe. However, what has actually happened is Tesla flubbed its Model 3 launch, just like it flubbed the Model X launch. Elon Musk's team is now engineering the production of this modern marvel on the fly trying to push cars out the door and failing miserably. Musk had predicted about 5,000 units would be delivered in October but managed about 145 by Inside EVs' best estimate. Meanwhile, BMW has sold 3,286 330e plug-in hybrid electric vehicles in 2017 compared to Tesla's 367 Model 3s. In October, BMW delivered 292 of its 330e EVs. Almost exactly double the number of Model 3s that found their way into customers, or shall we say Tesla employees', driveways. For the year, BMW has sold and delivered 15,253 electric vehicles of all types. Sports cars (i8), sport utility vehicles (X5 xDrive 40e), sedans (330e, 530e, and 7403) and whatever you prefer to call the i3. Tesla, supposedly the leader in luxury EVs, has delivered 37,257 vehicles in that same period. Right now, the BMW 3 Series is outselling all of Tesla's models combined. By the look of things, it is BMW who is succeding on intruding onto Tesla's space, not the other way around.